The government and banks are working out a package for low- income home loan borrowers, likely to be announced by the weekend, wherein a loan up to Rs 25 lakh will bear an interest rate of 10-11 per cent, a loan of up to Rs 10 lakh will bear 8-9 per cent interest, and a loan of up to Rs 5 lakh will attract 7-8 per cent interest. The country's largest lender, State Bank of India, today said it would review interest rates soon following monetary measures taken by the Reserve Bank of India last week. "We are going to review rates," State Bank of India chairman O.P. Bhatt told reporters here. Inflation fell for the fifth consecutive week to a seven-and-a-half-month low of 8 per cent due to cheaper food items, justifying the RBI stance to ease money supply to shift bias towards boosting growth instead of controlling prices. With global financial crisis directly affecting banking system and financial markets in India, Asian Development Bank (ADB) has scaled down growth projections for Indian economy to 7 per cent in 2008 from 7.4 per cent forecast earlier. The Indian rupee today shot up by 65 paise to end the day at one-month high of 48.33/34 against the US currency on sustained heavy dollar selling amid hopes of increased capital inflows. The growth of key infrastructure industries slowed down to 3.4 per cent in October from 4.6 per cent a year ago mainly on account of drop in production of steel and crude oil. 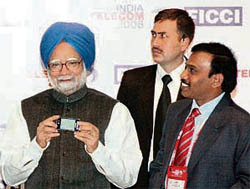 Prime Minister Manmohan Singh today ushered in a new era in the Indian telecom sector with the launch of the next generation 3G services of the state-run Mahanagar Telephone Nigam Ltd (MTNL). The government is likely to come out with a second stimulus package to propel economic growth, commerce and industry minister Kamal Nath said today. Safeguarding the interest of retail investors and further tightening the norms for close-ended schemes, capital market regulator SEBI today said such schemes will hence have to be listed and that their net asset value will also have to be calculated daily by mutual fund houses. The RBI today strongly defended that the monetary policy measures taken by the apex bank had yielded positive returns. The Punjab government is offering a plethora of incentives to the German wholesale retailer, Metro Cash & Carry, which is all set to launch its operations in the state next month. India's exports declined by around 10 per cent in November, showing a negative trend for the second month in a row this year, following a recession in the US and several other European markets. Although the government is yet to officially release the November figures, exports showed almost a double-digit decline on lack of demand in most of the buying markets, sources said. Tata Teleservices today launched Photon, a high-speed Internet access service, claiming to be 10-time faster than existing mobile wireless technology in Jammu and Kashmir. The government and banks are working out a package for low- income home loan borrowers, likely to be announced by the weekend, wherein a loan up to Rs 25 lakh will bear an interest rate of 10-11 per cent, a loan of up to Rs 10 lakh will bear 8-9 per cent interest, and a loan of up to Rs 5 lakh will attract 7-8 per cent interest. “The idea is to give a substantial relief for home loan borrowers up to Rs 25 lakh, which constitute nearly 80 per cent of the borrowers from banks,” say sources in the finance ministry. “At present, the home loan rate is between 11-12 per cent. This move will bring down burden substantially on the lower income groups who are major borrowers,” said a banker on the condition of anonymity. The difference between the rate charged by the banks and the new rates, likely to be effective by this weekend, will be borne by the government, the sources add. The other aspect that the banks and the government are working on is the criterion of margin money that the borrower will have to pay while applying for a home loan. Sources in the finance ministry close to the development say that this criterion could go as high as 90 per cent also. This would mean that banks will finance nearly 90 per cent loan of the value of property and the borrower will have to furnish a margin of only 10 per cent of the value of property. However, all is not going to be smooth sailing for the borrower and the dream home may still be a bit far. Reason being that bankers are reluctant to advance loans to certain income groups for the fear of job uncertainty and the loans going bad. The banker, who spoke to The Tribune in confidence, said borrowers who have government or permanent jobs will get a loan quickly. However, those on contract basis — which is the prevailing trend in most private sector workforce — might find it difficult to get the loan as the banks fear job loss of the borrower and the loan turning into a bad debt. In addition to reduction of interest rates, the government is also working on reduction in the stamp duties levied by states so that the overall cost of buying a house can be lowered. Sources say that there could be a uniform reduction of stamp duty by 5 per cent. The government and the RBI have already announced a series of steps to prop up the housing sector that has been crumbling. The measures include Rs 4,000 crore RBI line of credit to NHB to refinance housing finance companies and easing of norms for rescheduling loans. The RBI had reduced repo and reverse repo rates by 100 basis points each to 6.5 per cent and 5 per cent respectively, effective from Monday. Soon after RBI's decision, three banks namely Yes Bank, HDFC Bank and Union Bank reduced the benchmark prime lending rate by 50 basis point each. SBI had last month slashed benchmark prime lending rate by 75 basis points to 13 per cent. Commenting on the economic package, ahead of Indian Bank Association meeting, Bhatt said, "There are lot of things happening to stimulate demand in economy. Still there is a feeling that more is required". Wholesale price inflation came down by 0.40 per cent for the week ended November 29, from 8.40 per cent a week ago and is expected to come down further when the data is released next week, as then fuel prices cuts would also be reflected. In fact, the rate of price rise in all certainty is expected to moderate substantially with cascading effect of fuel price cut and four per cent across the board excise duty reduction getting mirrored in the data in subsequent weeks. "Policy responses to inflation has brought down the inflation below 9 per cent and we expect further reduction," commerce minister Kamal Nath said here, adding it was a good sign. Many food items like vegetables, fruits, gram, barley, unrefined oil, gur and rapeseed and mustard oil turned less costlier, even as most other indices either rose or remained unchanged. However, even then food inflation for the week was higher at elevated level of 10.52 per cent compared to 10.48 per cent a week ago. Incidentally, the inflation was at 3.89 per cent during the corresponding period a year ago. Besides, ADB estimated Indian economy to further slow down to 6.5 per cent in the coming calendar year from its earlier projection of 7 per cent. "India, South Asia's most dynamic economy in recent years, is reeling from the direct effect of the global financial crisis on its banking systems and financial markets. The growth projection for India has been revised down to 7 per cent in 2008 and 6.5 per cent in 2009, from 9 per cent in 2007," ADB said. On Tuesday, the World Bank projected Indian economy to grow by 6.3 per cent in 2008 and 5.8 per cent in 2009. Indian economy grew by 7.8 per cent in the first half of this fiscal against 9.3 per cent a year ago. For the whole of the last fiscal, the economy grew by 9 per cent and various projections for 2008-09 peg the economy to grow anywhere in the range of 7-8 per cent. In its special note on developing Asia's prospects in the global slowdown, ADB, however, retained the growth projections for Pakistan economy at 8 per cent for 2008. But, projection for 2009 was lowered to 3.8 per cent from earlier estimate of 4.5 per cent. ADB also reviewed downwards forecast for Chinese economy to single-digit growth of 9.5 per cent for this calendar year from earlier 10 per cent. Dealers in foreign exchange said while Indian banks continued their dollar selling, foreign lenders also joined the selling bandwagon, helping the rupee to improve for the second straight day. The rupee also got support from fall in the inflation rate to 8.0 per cent for the week ending November 29, expecting the central bank to ease key rates further. Foreign Institutional Investors (FIIs), who were net sellers to the tune of $644 million in the last month, turned net buyers and they pumped in $482.90 million in equities between December 4 and 10, aiding the rupee rally. They added that the government's stimulus package for the economy also boosted the rupee sentiment. In fairly active trade at the Interbank foreign Exchange (forex) market, the domestic unit opened firm at 48.80/81 a dollar a dollar and immediately touched a low of 48.83. The growth in the six core industries — crude oil, petroleum and refinery products, coal, electricity, cement and finished steel — contracted for the April-October period to 3.9 per cent from 6.6 per cent in the same period last year. The government released the core sector data, having a weight of 26.7 per cent on the overall industrial production, a day before the Index for Industrial Production data would be released. After dipping to 2.3 per cent in August, the growth in these industries improved to 5.1 per cent in September, raising hopes of a revival in the industrial growth. However, performance in October belied hopes as the rate of expansion dropped to 3.4 per cent. The crude oil production remained in the negative territory showing a decline of 0.3 per cent in October. Reeling under the demand recession, steel took the hit and registered a negative trend of 0.5 per cent. However, petroleum refinery products followed the reverse trend by expanding by five per cent against 2.7 per cent. Cement production declined to 6.2 per cent against 7.5 per cent in the period. However, coal showed an improvement at 10.9 per cent against 8.9 per cent. Electricity also put up an improved performance of 4.4 per cent as compared to 4.2 per cent. The public sector telecom company is the first telecom operator in the country to offer 3G services on its network which has been named “Jaadu”. Communications and IT minister A. Raja, who was also present on the occasion, made a video call, demonstrating the capabilities of 3G services. While launching the services, which would initially be available in Delhi only, the Prime Minister said: "I congratulate MTNL and the communications minister for launching the 3G services." "Competition has to be a major propeller of the Indian economy and it has to be a sustainable one," he said while demonstrating the mobile TV facility available with 3G services. "However, effective objective and impartial regulations have to be an integral part of all these processes for investors to invest further," he added. Besides MTNL, BSNL has also been allotted the spectrum for the launch of 3G services ahead of the private operators, who would have to go through the bidding process which is expected to be completed by February next year. However, both state-run operators would pay a fee equivalent to the highest bid made by a private operator in that particular sector. Speaking on the occasion, Raja said, "BSNL and MTNL have already been allotted 3G and broadband wireless access spectrum with a view to ensuring early rollout of 3G and Wi-max services in the country." BSNL is expected to launch its 3G services in Chennai next month. It is waiting for supply of some equipment from foreign vendors following which the services could be launched. Raja talked about the importance of revenue generated through licensing fees and sale of spectrum. He said, "After migrating to revenue- sharing regime, this sector has contributed Rs 500 billion (Rs 50,000 crore) through licence fee, entry fee and spectrum charges till the end of last financial year." "During this financial year alone, it is expected that about Rs 160 billion (Rs 16,000 crore) will be collected from the licence fee and the spectrum charges," he added. The minister also said mobile number portability (MNP) would be implemented in metros and category A circle by the middle of 2009 and the entire country by the end of next year. "We have to ensure that our domestic demand continues and government will be taking all steps... We are again looking at something (package) for next week," he told reporters after a function organised by Spanish Institute of Foreign Trade and industry chamber Ficci here. In the next package, the minister said, "We will look at engineering sector, greater re-finance facility for exporters and textile and agriculture sectors." As part of an estimated about Rs 35,000-crore stimulus package last Sunday, the government reduced four per cent excise duty across the board and announced plans to raise public expenditure by additional Rs 20,000 crore during 2008-09. The Reserve Bank has already pumped in additional Rs 3 lakh crore into the system to ease credit crunch being faced by the companies. "The units (close-ended scheme) shall be mandatorily listed...NAV shall be computed and published on daily basis," the SEBI said. All schemes, except equity-linked saving schemes, will hence be required to get listed and trustees will have to ensure that before the launch of the scheme, the in-principle approval for listing has been obtained from stock exchanges. Analysts say the move may take a hit on the returns of such schemes which are likely to come down and there is a possibility that the attractiveness of investments in close-ended schemes may decrease. "The measures are in the best interest of retail investors. The SEBI move has come as corporates and HNIs use MFs as a tax evasion tool and make an exit when the returns start to fall, while long-term retail investors suffer negative returns pressure after the corporates move out of the schemes," a mutual fund industry expert said. Further, experts said that," Fixed maturity products of six months extent could lose their charm and only FMPs of long duration may remain in flavour. Investors would shift from close-ended to liquid schemes which could provide the desired support to the capital market". Asked whether the monetary measures adopted by the central bank had failed to revive the economy, RBI Governor D Subbarao told reporters here, "Steps taken by the apex bank have resulted in positive returns". He stated that the recent reduction in repo and reverse repo rates to infuse liquidity are appropriate. Asked if there was further scope for reducing the CRR from the present levels of 5.5 per cent, the RBI governor said that the apex bank was constantly reviewing the situation. "Going forward, RBI will do whatever is appropriate", Subbarao said. "In the next review of the economy, the apex bank would set targets for growth and inflation", he said. Subbarao said the central board today reviewed the economic situation of the country and added that the financial crisis had an adverse impact on the Indian economy. The manner in which the things are moving, the future is uncertain, "it is not possible to calibrate the road map", he said. The RBI governor said that the crisis was evolving and nobody has a complete picture of that. "The crisis is significant", he said. While supporting the monetary measures adopted so far, he also said that government action in terms of fiscal stances was also necessary to take the economy out of the present crisis. During a meeting with Punjab Chief Minister Parkash Singh Badal, here today, the company officials led by Erik Schmit, director development and expansion, sought that they be given licence exemption for holding land over and above the land ceiling limit, exemption from the APMC Act so that their distribution centres can be treated as open stock yards (which enables them to get exemption from market taxes). They also demanded wholesale liquor licences for imported liquor and wines; an early clearance of their project under the single- window clearance scheme; and, change in land use be expedited. Top Punjab government officials informed TNS that all these concessions have been okayed by the Chief Minister, before the project comes up for final approval before the Empowered Committee next month. It is learnt that Metro Cash & Carry will be launching its operations in Punjab on January 15, when a ground-breaking ceremony will be held at Zirakpur. The Indian arm of the company proposes to invest Rs 900 crore for setting up its operations across four districts in the state. Metro is actively looking at Punjab not only to set up its retail business but also for the easy availability of fresh produce. The company is, in fact, looking at Punjab as a major sourcing hub for their centres across India. 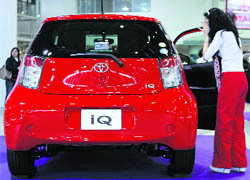 The Metro Group already has a sourcing company based in Delhi, Metro Group Buying, which does its export-based sourcing. Metro, which has over 600 centres in 29 countries, has already set up stores in Kolkata, Bangalore, Hyderabad and Mumbai. Last year, Metro procured products worth Euro 60 million from different states in India. The company proposes to set up two distribution centres at Ludhiana and one each at Mohali, Zirakpur, Jalandhar and Amritsar. Each of these centres will come up on an area of 8 acres and will become operational by 2010. The company has already purchased two sites in Ludhiana and one in Amritsar, for setting up these distribution centres. These centres will be a one-stop shop offering a range of food (including fresh fruits and vegetables) and non-food products to cater to the needs of its customers. Metro will bring the business-to-business model to meet the requirements of retailers, caterers, hotels and restaurants. Following the global financial meltdown, the country's exports for the first time after a gap of seven years dipped by over 12 per cent in October. India has been facing the ripple effects of the global financial turmoil, which has resulted in slowdown of country's exports. These services would be available in Jammu, Srinagar, Udhampur, Katra, Bari Brahmna, Samba GurMandi, Kathua and Lakhanpur area, said Atul Kansal, circle operating officer, Jammu and Kashmir, at the launch here. With Photon, customers can avail the benefit of multiple infotainment services such as access to rich text and images, Web browsing, blogging, network on friendship sites and enter forms for travel, e-commerce, jobs, entertainment and more. Photon Internet access service allows customers to be connected — not only for mails, but also for downloads, large files uploads, photo sharing, etc. It also allows users to send and receive SMSes and is compatible with both laptops and desktop PCs, he added.